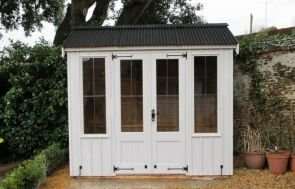 This National Trust Orford Summerhouse has been installed in the corner of our customer’s large garden in Horsham, West Sussex to use as a lovely, relaxing garden room to enjoy throughout the summer months. This is the 3.0 x 3.0m Orford, which is the larger of the two sizes we make in this design. This means that there will be plenty of room inside for the customer to place a few comfy chairs and a table inside for them to relax in and admire their garden from. The Orford has got a pent roof with a black corrugated roofing material on to protect the building from wind, rain and other harsh elements, and the slope of the roof will allow rainwater to drip off the back so it won’t pool on top (which may cause damp to build up). As you can see, this is a very traditional looking building, and this look has been achieved with the leaded windows, cast iron door and window furniture in the Fleur-de-Leys style, and the vertical sawn boards. As well as having door hooks to keep the doors open on warm, summer days, two of the four windows can also be opened, so the customer will have an abundance of natural air flowing through the summerhouse. If you like the look of this summerhouse, please download the National Trust brochure to see if you like the look of any of our other designs. There are four Summerhouses and four Garden Sheds in the range in total. You can also Contact Us online or call us on 01760 444229 to speak to our helpful team about your requirements.